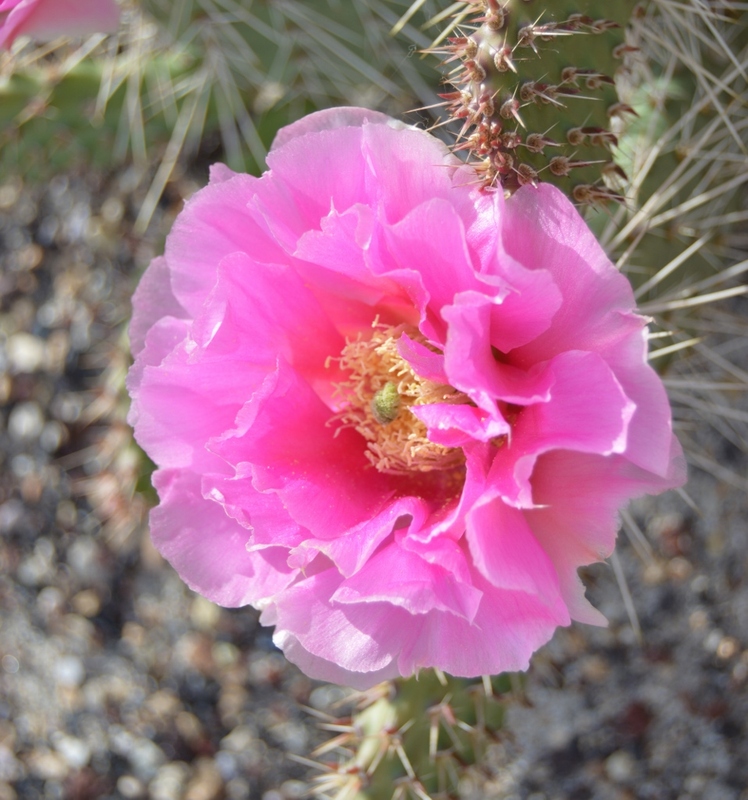 Opuntia polyacantha X rhodantha "Pink Supernova"
- $18 minimum purchase for plant orders. - International orders welcome, however the shipping is expensive along with phytosanitary documentation & nematode testing required for live plant shipments. Buy button provided below for documentation fee. Minimum purchase, in addition to the phyto, is $200 USD ( = $280 USD minimum purchase ). - Selecting plants from outside the recommended zones will void the 3 month money back guarantee and will be highlited on the invoice you receive. - I highly recommend reading through the Cultivation Page ( accessible on the blue navigation menu at the top and bottom of this page ) for instructions on how to prepare proper drainage and soil conditions if your new to growing cacti. Transplant instructions are also printed on the back of invoice. Lincoln Co., NV, 5200 feet ( 1585 m ), Heat / cold hardiness: Z5b-8b, Tall branching plants with reddish silver spines. Small greenish yellow flowers appear in late spring to early summer. 2 offers: Rooted cutting for $12.50, Un-rooted cutting for $8.50. Ex cultivation. Heat / cold hardiness: Z5b-8b, Tall, open branching plants. From garden specimens that have survived over 30 years here in SW Idaho. Large purple lavender flowers in mid to late spring. 2 offers: Rooted cutting for $12.50. Un-rooted cutting for $8.50. El Paso Co., CO, 6000 feet ( 1830m ) Heat / cold hardiness: Z5b-8b, More compact Colorado plants with rare white flowers. Cylindropuntia imbricata "Rio Arriba Giant", "Tree Cholla Cactus", 96"H x 72"W ( m 3H x 2W ), Rio Arriba Co. NM, 7000 feet ( 2134 m ), Heat / cold hardiness: Z5b-8b, Very thick stemmed form from high elevation in NW New Mexico. Flowers magenta with lighter throats. 2 offers: Rooted cutting for $12.50 each, Un-rooted cutting for $8.50. Cylindropuntia imbricata "Manzano Pink", "Tree Cholla Cactus", 96"H x 72"W ( m 3H x 2W ), Torrance Co. NM, 6800 feet ( 2073 m ), Heat / cold hardiness: Z5b-8b, Yellowish more dense spines on this form. Flowers a lighter shade of pink. Grant Co. NM, 5500 feet ( 1677 m ), Heat / cold hardiness: Z7a-9a, Previously listed as C. imbricata, now keyed out as C. spinosior. Vigorous tall plants with large reddish pink flowers in mid to late spring. Santa Fe Co., NM, 6000 feet ( 1829 m ), Heat / cold hardiness: Z5b-8b, Medium sized, densely branched shrubs with light greenish orange flowers in mid to late spring. Cylindropuntia whipplei "Yavapai", "Whipple's Cholla Cactus", 36"H x 48"W ( cm 92H x 122W ), Yavapai Co., AZ, 5000 feet ( 1524 m ), Heat / cold hardiness: Z5b-8b, Very densely branching shrubs with short, pure white spines. Flowers greenish yellow appear in mid to late spring. 92H x 122W ), Washington Co., UT, 5700 feet ( 1738 m ), Heat / cold hardiness: Z5b-8b, Densely branched shrubs with yellow gold spines that nearly obscure the stems. Flowers greenish yellow appear in mid to late spring. Washington Co., UT, 5200 feet ( 1585 m ), Heat / cold hardiness: Z5b-8b, Hybrid form with extra large, bright green pads. Flowers are light pink with hues of orange and yellow. Washington Co., UT, 5200 feet ( 1585 m ), Heat / cold hardiness: Z5b-8b, Hybrid form with bright green pads and peach orange flowers with yellow throats. 2 offers: Rooted cuttings for $12.50, Un-rooted cutting for $8.50. Opuntia X aurea "Morning Glow", "Utah Beavertail Cactus", 12"H x 60" W ( cm 31W x 153W ), Washington Co., UT, 5200 feet ( 1585 m ), Heat / cold hardiness: Z5b-8b, Unusual hybrid form with elongated, sprawling pads and very soft, light yellow flowers. Washington Co., UT, 5200 feet ( 1585 m ), Heat / cold hardiness: Z5b-8b, Hybrid form with bright green pads and large, silky, pure pink flowers. Coconino Co., AZ, 5300 feet ( 1616 m ), Heat / cold hardiness: Z5b-8b, Hybrid form with more upright growth and rare red flowers with yellow throats. Flickr photo gallery link, 5 pictures. rocky ridges off Nevada's Extra-Terrestral highway. Nye Co., NV, 6000 feet ( 1829 m ), Heat / cold hardiness: Z5b-8b, Classic gray padded form producing extra large pads under garden conditions. Bright pink flowers. Esmaralda Co., NV, 5500 feet ( 1677 m ), Heat / cold hardiness: Z5b-8b, Olive green pads and a more upright growing habit. Bright pink flowers. Plants are opportunistic and can produce additional growth and flowers with supplementary water or summer monsoonal rains. 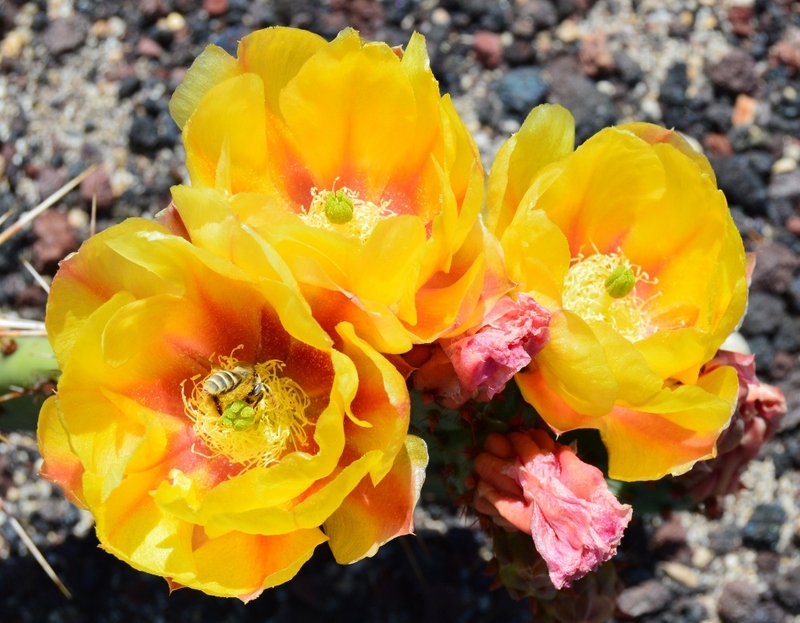 Opuntia columbiana "Apricot Dreams", "Columbiana River Prickly Pear", 6"H x 36" W ( cm 16H x 92W ), Owyhee Co., 3500 feet ( 1037 m ), Heat / cold hardiness: Z5a-8a, Smaller dark green pads produce bright yellow flowers, fading to deep apricot. Lincoln Co., NV, 4100 feet ( 1250 m ), Heat / cold hardiness: Z6b-9b, Dense, hairy, pure white spines cover pads on upright growing plants. Bright pink flowers. Opuntia polyacantha var. erinacea "Inyo", "Grizzly Bear Cactus", 30"H x 36"W ( cm 77H x 92W ), Inyo Co., CA, 6800 feet ( 2073 m ), Heat / cold hardiness: Z6a-9a, High elevation form with smaller pads and dense shaggy spines. Light yellow flowering population. Washington Co., UT, 3900 feet ( 1189 m ), Heat / cold hardiness: Z6a-9a, Large pads form huge clumps. Rich yellow flowers with orange stripes and throats, fading to apricot, followed by fleshy sweet fruits in mid to late summer. 2 offers: Rooted cutting for $18.50, Un-rooted cutting for $12.50. Washington Co., UT, 4800 feet ( 1464 m ), Heat / cold hardiness: Z6a-9a, Jumbo pads form broad clumps. Large yellow flowers with light orange stripes and green throats, followed by large dark purple, mildly sweet fruits. 2 offers: Rooted cutting for $21.50, Un-rooted cutting for $16.50. Yavapai Co., AZ, 5700 feet ( 1738 m ), Heat / cold hardiness: Z6a-9a, Somewhat smaller pads with a bluish tint. Large yellow flowers with light orange stripes and green throats, followed by medium small dark purple fruits with a mild sweet flavor. 2 offers: Rooted cutting for $18.50, Un-rooted cutting for $13.50. Socorro, Co. NM, 5000 feet ( 1524 m ), Heat / cold hardiness: Z7a-10a, Bluish gray, near spineless, pads, turning purple in drought and, or cold conditions. Flowers yellow with red throats. Plants are opportunistic and can produce additional growth and flowers in response to summer monsoonal rains. Opuntia nicholii X hystricina "Woolly Mammoth", "Marble Canyon Prickly Pear", 12"H x 72" W ( cm 31 x 183W ), Kane Co., UT, 4800 feet ( 1464 m ), Heat / cold hardiness: Z5b-8b, Intermediate form with near shaggy, rigid, pure white spines that nearly obscure the pads. Extra large pure pink flowers. Flickr photo gallery link: Unavailable. New pictures coming soon. Opuntia phaeacantha "Kaibab Pink", "Brown Spined Prickly Pear", 12"H x 72"W ( cm 31H x 173W ), Coconino Co., 6200 feet ( 1890 m ), Heat / cold hardiness: Z6a-9a, Another excellent form with uniform, thick white spines and pink flowers. Opuntia phaeacantha "Kaibab Red", "Brown Spined Prickly Pear", 18"H x 60"W ( cm 31H x 153W ), Coconino Co., AZ, 6200 feet ( 1890 m ), Heat / cold hardiness: Z6a-9a, Another exceptional form with a more compact, upright growing habit and sporting rare, large red flowers. Coconino Co., AZ, 6350 feet ( 1936 m ), Heat / cold hardiness: Z6a-9a, Definitive form with small pads and long, thick white spines. Super vivid pink flowers. Opuntia polyacantha X rhodantha "Golden Fire", "Plains Prickly Pear", 10"H x 48"W ( cm 26H x 122W ), Lincoln Co., ID, 4700 feet ( 1433 m ), Heat / cold hardiness: Z5a-8a, Long needle spines on small pads form low broad clumps featuring jumbo golden yellow flowers with red centers, fading to deep rusty orange. Opuntia polyacantha X rhodantha "Big Red", "Plains Prickly Pear", 10"H x 48"W ( cm 26H x 122W ), Lincoln Co., ID, 4700 feet ( 1433 m ), Heat / cold hardiness: Z5a-8a, Short uniform white spines on small pads form broad clumps which sport extra large pinkish red flowers. Opuntia polyacantha X rhodantha "Triple Crown", "Plains Prickly Pear", 10"H x 48"W ( cm 26H x 122W ), Lincoln Co., ID, 4700 ( 1433 m ), Heat / cold hardiness: Z5a-8a, Dense needle spines on small pads featuring bright yellow flowers which change color rapidly to golden yellow, deep apricot, and occasionally pink upon closing. Opuntia polyacantha X rhodantha "Cassia Rainbow -- Pink", "Plains Prickly Pear", 6"H x 36"W ( cm 16H x 92W ), Cassia Co., ID, 6200 feet ( 1890 m ), Heat / cold hardiness: Z4b-7b, A more petite form with short spines on smaller pads bearing superlative light pink flowers with hues of orange and yellow. Opuntia polyacantha X rhodantha "Pink Supernova", "Plains Prickly Pear", 12"H x 48"W ( cm 31H x 122W ), Lincoln Co., ID, 4700 feet ( 1433 m ), Heat / cold hardiness: Z5a-8a, A more upright growing form with long needle spines and double petaled light pink flowers. Opuntia polyacantha X utahensis "Snake River Orange", "Plains Prickly Pear Cactus", 8"H x 48" W ( cm 21H x 122W ), Elmore Co, ID, 3000 feet ( 915 m ), Heat / cold hardiness: Z5b-8b, Distinctive form with robust pads as wide or wider than long and thick white spines on the upper half, forming dense clumps. Large, rare grapefruit-orange colored flowers with a hint of pink. Flickr photo gallery link, 6 pictures. Opuntia polyacantha X utahensis "Butter Rose", "Plains Prickly Pear Cactus", 8"H x 48"W ( cm 21H x 122W ), Elmore Co., ID, 3000 feet ( 915 m ), Heat / cold hardiness: Z5b-8b, Robust, wide pads forming dense clumps. Flowers begin as pure butter yellow, developing unusual splotched orange-apricot patterns as they age. Petals have an unusual characteristic of re-curving back as they close, revealing darker inner colors. Flickr photo gallery link: 6 pictures. Opuntia X woodsii "Wildfire", "Zion Prickly Pear Cactus", 36"H x 72"W ( cm 92H x 183W ), Washington Co., UT, 4600 feet ( 1403 m ), Heat / cold hardiness: Z6b-9b, A more definitive O. phaeacantha X engelmannii hybrid form with large pads and more upright growing habit. Flowers reddish orange with a hint of pink. Large meaty fruits with a mild citrus sour flavor by mid to late summer. Opuntia X woodsii "Sandstone Sunrise", "Zion Prickly Pear Cactus", 36"H x 72W ( cm 92H x 183W ), Washington Co., UT, 4600 feet ( 1403 m ), Heat / cold hardiness: Z6b-9b, Large pads with a more upright growing habit sport extra large orange flowers followed by large, juicy, sweet flavored fruits by mid to late summer.  > = De-notes new list item since last major update. Memo: $18 minimum on plant orders. Thank you! Opuntia polyacantha X rhodantha "Big Red "
Kane Co., UT, 5500 feet ( 1677 m ), Heat / cold hardiness: Z5b-8b, Classic form with bluish gray pads that grow in chains, forming large open clumps. Flowers pure yellow, fading to deeper yellow. 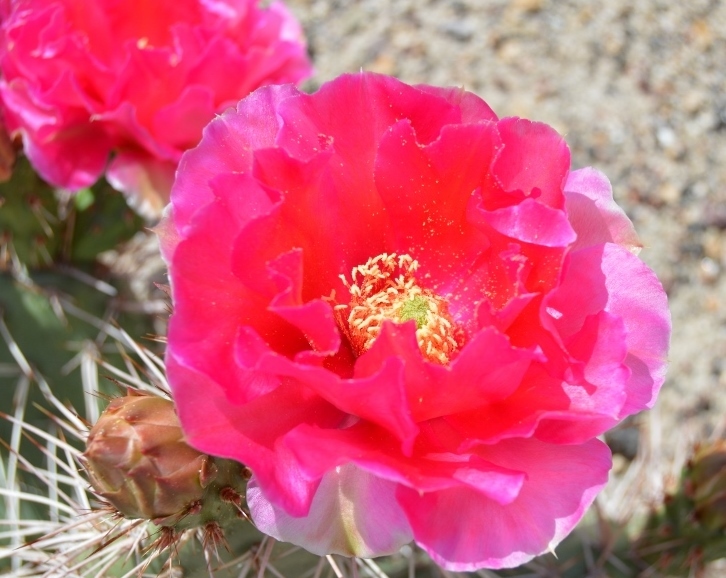 Plants are opportunists and can produce additional growth and flowers with supplementary watering or monsoonal rains. Opuntia X aurea "Virgin River Rainbow", "Utah Beavertail Cactus", 18"H x 72"W ( cm 46H x 183W ), Washington Co., UT, 5200 feet, ( 1585 m ), Heat / cold hardiness: Z5b-8b, Hybrid form with extra large, bright green pads. Flowers mainly pink with hues of orange, red & yellow. Opuntia azurea var. diplopurpurea, "Coyotillo", "Purple Prickly Pear", 24"H x 72"W (cm 61H x 183W) Brewster Co., TX , 4000 feet ( 1219m ), Heat / cold hardiness: Z7a-10a, Blue-gray medium sized pads, occasionally turning purple in drought or cold. Spines black, few, along the upper half of the pads. Flowers light yellow, cup shaped, with blood red centers. Plants are opportunistic and can produce additional growth and flowers if given supplementary water during the heat of summer. Opuntia columbiana "Little Stars", "Columbia River Prickly Pear", 8"H x 36" ( cm 21H x 92W ), Owyhee Co., ID, 3500 ( 1067m ), Heat / cold hardiness: Z5b-8b, Slender, finger like stems and short brown-black spines forming fairly compact mats. Flowers pure yellow, tiny, star like, fading to deep orange and occasionally to cinnamon red. Opuntia columbiana "Spiny Quarters", "Columbia River Prickly Pear", 5"H x 36"W ( cm 13H x 92W ), Owyhee Co., ID, 3500 feet ( 1067m ), Heat / cold hardiness: Z5b-8b, Tiny, quarter sized, rounded, flat pads with sparse white spines, occasionally black, forming tight mats. Flowers bright yellow with red filaments, turning brownish red in the centers as they age. Eddy Co., NM, 4100 feet ( 1250m ), Heat / cold hardiness: Z7a-10a, Medium to large pads of bluish gray sport thick blackish gray spines turning purple in heat or cold stress. Flowers bi-colored yellow red. Classic form here with good cold tolerance. Flickr photo gallery link, 6 picturs. Lincoln Co., ID, 4700 feet ( 1433m ), Heat / cold hardiness: Z5a-8a, Rounded pads with reddish white spines forming low, broad mats. Flowers are extra deep magenta to 3 1/2 inches in diameter. Cassia Co., ID, 6500 feet ( 1982m ), Heat / cold hardiness: Z5a-8a, Smaller rounded pads with thick white spines forming dense mats. Flowers are a very soft orangey pink to 3 inches in diameter. Cassia Co., ID, 6500 feet ( 1982m ), Heat / cold hardiness: Z5a-8a, Bright yellow flowers fading through peach, pink & reddish hues before closing. Thick white spines over rounded pads. Cassia Co., ID, 6500 feet ( 1982m ), Heat / cold hardiness: Z5a-8a, Smaller rounded pads with thick white spines. Flowers light orange with a hint of pink to 3 inches in diameter. Opuntia polyacantha X utahensis "Snake River Rose", "Plains Prickly Pear", 8"H x 48"W ( cm 21H x 122W ), Elmore Co., ID, 3000 feet ( 915 m ), Heat / cold hardiness: Z5b-8b, Broad spreading mats of low thick pads produce vivid, waxy pink flowers with a hint of red. Rooted cuttings old out! Next availability early summer 2019. Rooted cuttings sold out.! Next availability early summer 2019. Rooted & unrooted cuttings sold out for 2019! Next availability early summer 2020. Rooted cuttings sold out! Next availability early summer 2019. Rooted & Unrooted cuttings sold out! Next availability late 2019. > Opuntia polyacantha X rhodantha "Cassia Rainbow - Red", "Plains Prickly Pear", 6"H x 36"W ( cm 16H x 92W ), Cassia Co. ID, 6200 feet ( 1890 m ), Heat / Cold hardiness: Z4b-7b, From the same population as "Cassia Rainbow - Pink" above is this outstanding half pink red flowering plant. Small pads and dense spines. > Opuntia polyacantha X rhodantha "Canary Rose", "Plains Prickly Pear", 8"H x 48"W ( cm 21H x 122W ), Cassia Co., ID, 6500 feet ( 1982m ), Heat / Cold hardiness Z4b-7b, Exceptional deep orangy yellow flowers on this form with tight growth and thick white spines. One of the best pure yellow flowers I've ever seen fading into peachy colors late in the day. 2 offers, Rooted cutting $12.50, Unrooted cutting $8.50. > Opuntia polyacantha X rhodantha "Rainbow Delight", "Plains Prickly Pear", 8"H x 48"W ( cm 21H x 122W ) , Cassia Co., ID, 6500 feet ( 1982 m ), Heat / Cold hardiness: Z4b-7b, Delicate light pink yellow flowers in a rare color combination. Sun intensity can age the colors into more pinkish or orange colors. Nice thick white spines on rounded pads. 2 offers; Rooted cutting $12.50, Unrooted cutting $8.50. Roosevelt Co., NM, Heat / cold hardiness: Z6a-9a, Attractive low to medium sized shrubby plants with dense golden yellow spines. Flowers unseen, should be greenish yellow. Stems easily detach so take extra care to minimize contact. ex. cultivation ( origin: South America, Argentina, Patgonia region ) Heat / cold hardiness: Z6a-9a. A most unique cactus forming low spiny evergreen mats with persistant succulent leaves. Fractal like growth on the stems. Flowers are slow to come and appear after plants reach a foot or more in diameter. Flowers pale yellow. Fruits are edible, sour, and citris like. Plants prefer cooler weather and should be planted in an area with broken shade in the afternoon hours in hotter zones. 1 offer, 2-3 inch wide seedling, shipped bare root for $12.50 each. ex. cultivation ( origin: South America, Argentina, Mendoza & Neuquen Provinces ) Heat / cold hardiness: Z6b-9b. Stacking cylindric stems form dome like mounds in age. Spines few and short. Flowers unseen. Takes up little space and will pair best with barrel & hedgehog cacti. Stem segments of this variety are fragile and easily detached and precautions should be taken to minimize contact. Rooted cuttings sold out! Next availability mid summer 2019. Rooted & Unrooted cuttings sold out! Next availability late 2020.